We’ve been hearing a lot about chatbots recently, and with predictions that they will be responsible for managing 30% of customer experiences by 2022, it’s no surprise commercial leaders are taking note. 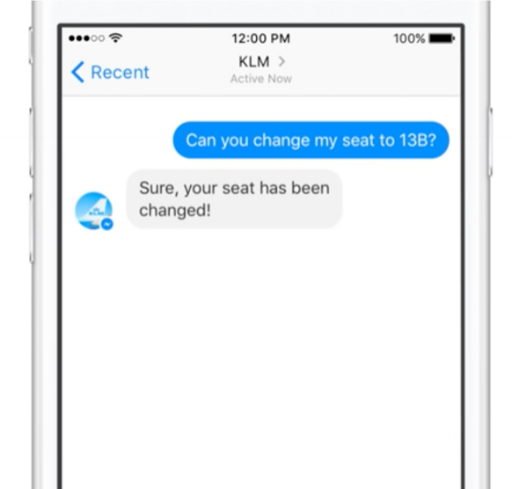 But it’s not just the B2C space that is expected to embrace conversational bots. There are huge opportunities for bots in enterprise, particularly for internal operations. In fact, we can expect a 10% increase in staff productivity thanks to bots in the next two years, according to Gartner. Considering B2E bots are still at the early stages of adoption within the industry, this is a promising figure. work on behalf of users, brokering first, second and third party services and knowledge. They can be generalist, like Alexa and Siri or more specialist, provided by specific brands. are implemented by enterprises to support customers, simulating conversations that deliver information or specific actions on behalf of a customer. They can help customers with onboarding, payments or general support. exist within an organisation, enabling employee engagement with staff and enterprise systems. VEA’s are generally integrated into front ends of enterprise software and can be used for scheduling, personalised reporting and data collection. While VPA’s have a broader scope and VCA’s are more consumer facing, VEA’s are very much enterprise specific and offer huge value for businesses and organisations internally. In fact, big names like Microsoft, Amazon and IBM have recognised the potential and introduced services that allow companies to build bots for internal use, enabling them to exploit some of their artificial intelligence capabilities. We’ve answered some of the big questions around chatbots before, but when it comes to enterprise and VEA’s, there are different approaches and offerings. What benefits could a company gain from integrating chatbots into their operations? And importantly, where does a company begin if they want to integrate these bots into their operations? VEA’s offer a wide range of potential use cases. From functionally narrow bots that exist in messaging platforms like Slack, all the way to Amelia, the cognitive agent that undertakes different roles throughout an organisation, the flexibility that chatbots offer to enterprise makes for many different points of value. With the right design and development, they can provide business specific solutions in a meaningful way. Enterprise bots bring value in the form of convenience. They do this by building on internal services which already exist in your business, offering legacy systems a level of accessibility that was not available before. In short, they make interactions with existing internal services much simpler and more efficient by providing an interface that simulates a conversation, generally in a messaging platform. Chatbots can be used to manage tasks that are error prone or tedious, like scheduling and booking meeting rooms. These bots radically simplify staff engagement, reduce servicing costs and address use cases across many areas of day to day work life. They also remove the potential for human error, giving a structure and consistent approach to things like bug tracking, scheduling or reports. This leads to internal efficiency and more time for tasks which cannot be automated. From an operational point of view, VEA’s discourage silo structures in enterprise, focusing on a task centric approach. This reflects the direction which enterprise has been moving in for a while - it’s hard to think of a time before internal messaging tools, video conferencing and digital boardrooms. While these tools can all be seen as mediums of communication between staff and encourage a certain level of collaboration between team members, the potential of further leverage with the addition of bots is huge. For example, companies have been benefiting from ChatOps, or conversation driven development. Project teams engage in natural conversations using mediums like Slack or Hipchat and bots like Hubot bring the relevant tools to the conversations, working with plugins and scripts to automate tasks. The use of a conversational interface black-boxes complexities, meaning all members of a team can be included and responsibility for things like code deployment or bug tracking. VEA’s and chatbots are still maturing, so the ability to scale and adapt according to the environments changes is important for the early adopters. Bots have the ability to do this with ease - since they can be integrated into multiple platforms, there is no need to couple a bot with a specific system. Because of this, they require little infrastructure investment and offer a larger scope for development. So where do you begin? With conversational experiences maturing quickly, getting ahead in this space means starting now. Gartner recommends beginning with a proof of concept phase to understand the capabilities of the technology, the effort required by users developing conversational agents and the areas of opportunity that can be targeted within your business model. This exploration phase doesn’t have to be tedious - hiring a conversational experience expert to run a week long sprint could produce an outcome that not only identifies areas in your company that could benefit from bots but produce a POC that can be tested with your team. From here, research and development can begin, with conversation tree design, training sets and vendor selection requiring the biggest focus. This ensures the solution is not only scalable, but sustainable enough to support your teams well into the future.